Photograph of a Chamunda image at Jajpur, Cuttack District, taken by William Henry Cornish in the 1870s. M.H.H. Kuraishi described it in his List of ancient monuments...in the Province of Bihar and Orissa of 1931, "This image..is a remarkable piece of sculpture. 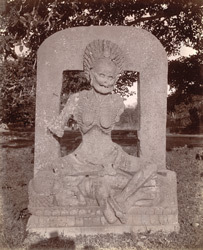 The goddess is represented as the hideous skeleton of a decrepit old woman, all bones and skin and no flesh, seated in an easy posture on a prostrate human being. She wears necklaces of human skulls and ornaments of bones; and had originally four arms, all of which are broken...The image is carved in chlorite and was brought from near the Mukti-mandapa in the vicinity. It is carved in full relief." The image is part of a group called the seven mothers. In the 1930s the image was situated in front of the Sub-Divisional Officer's bungalow.